CIS is a social model adult activities center designed to serve a variety of populations including individuals with mild to moderate memory loss. Participants can engage in a variety of activities that provide mental stimulation and physical health. CIS provides a structured program of activities in a supportive environment designed to enhance total health, including memory maintenance. Our caring staff and service partners provide education and support for family caregivers, enhancing the quality of life for everyone touched by memory loss. 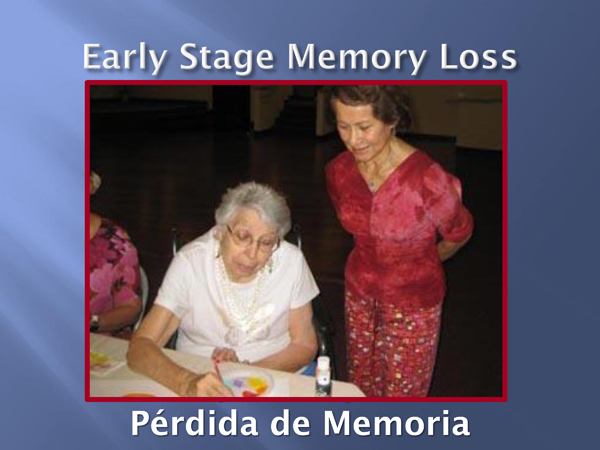 How do we help persons with memory loss? CIS offers a physical fitness program that includes machine-based circuit training, aerobic chair dance, Tai Chi, indoor and outdoor walks and Nintendo Wii Sports which require eye/hand coordination. The CIS Computer Learning Center has partnered with Posit Science to offer San Fernando Valley Seniors a scientifically validated program designed to improve memory, thinking and communication. The web-based, self-paced program includes a series of scientifically based, fun and engaging exercises. These exercises are designed to speed up brain processing and improve memory/brain function. "Art therapy is becoming increasingly recognized as having a contribution to make in the area of quality dementia care. Art therapy, which grew out of psychotherapy, engages with a person's creativity to initiate a process - whether through painting or drawing, sculpting or writing - that is healing and whole-making. The very process of being a creator empowers by allowing for a flow of energy and life. It makes well, because it is an essential part of being human. It strengthens because in using creative energy to make something external to the person, the work remains even after she or he has forgotten creating the image." Dr. Patricia Baines, author, Alzheimer's Australia Tas.